You probably know that Vitamin C boosts the immune system and that calcium strengthens bones, but if you don’t know how important getting enough magnesium is to your health you may be missing out on some important health information. As the 4th most abundant mineral in the body magnesium is responsible for over 300 biochemical processes including the regulation of calcium, potassium and sodium levels, protein synthesis, regulating blood sugar levels and blood pressure, maintaining muscle and nerve function, keeping the heart rhythm steady, the absorption of other minerals, keeping bones strong, detoxification and so much more. Whoa, that’s a lot! 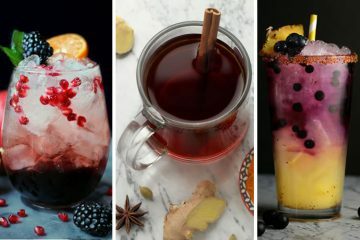 Dr. Norman Shealy, a world leading expert in stress and pain management has said, “Every known illness is associated with a magnesium deficiency and it’s the missing cure to many diseases.” And it’s believed that at least 80% of the population suffers from magnesium deficiency without even knowing it. The jury is in: magnesium is the nutrient we all need to get more of. Ever suddenly get a leg cramp that won’t let up or wonder why your eye just won’t stop twitching? It could be magnesium deficiency. Magnesium plays a big role in healthy neuromuscular signals and muscle contraction so if you’re deficient, these types of muscles abnormalities may occur. Restless leg syndrome is another warning sign of magnesium deficiency. To overcome leg cramps, muscle soreness and restless leg syndrome, you will want to increase your intake of both magnesium and potassium. Also lower levels of magnesium in the body can result in a buildup of lactic acid, causing pain and tightness in the muscles. Taking magnesium can help relieve pain and soreness as it helps to alkalize the body and keep healthy pH levels in check. For years we’ve been hearing “Make sure you get your calcium!” But if you’re taking calcium supplements without magnesium you may be contributing to your magnesium deficiency. Studies have shown that taking calcium by itself can reduce the amount of magnesium you absorb. Also, the presence of magnesium is required for calcium to even be absorbed into your bones. If that’s not enough, supplementing with calcium only has been linked to diseases like arterial calcification otherwise known as hardening of the arteries. Upping your daily intake of magnesium can actually improve the way the body uses of calcium and prevent onset of cardiovascular disease. You won’t be your best if you don’t get in a solid 6 to 8 hours sleep. Poor sleep quality can be a sign of magnesium deficiency and can even lead to insomnia, anxiety, hyperactivity and restlessness. One study found that taking magnesium before bed improved sleep quality. Life can be stressful and there’s no getting around it. And emotional and physical stress can both cause magnesium deficiency. Even things like surgeries, chronic diseases, medications or traumatic life events can play a part. In times of stress your body will need more magnesium than usual. If you’re already low, stress can exacerbate the problem. Also the stress hormones adrenaline and cortisol can increase when magnesium levels are low. Making sure you get enough magnesium will help to keep you calm and collected. Panic and anxiety symptoms are the worst. And since magnesium has a calming affect on the central nervous system, low levels of magnesium can cause irritability and nervousness. As magnesium levels continue to drop, it can leave you prone to high levels of anxiety, depression, panic attacks. Supplementing with magnesium has been shown to help promote a sense of calm while relaxing muscles and improving mood. A study published in The American Journal of Clinical Nutrition found that a diet rich in magnesium may reduce the risk of a stroke by 8 percent. Another study in the Circulation Journal tested the effectiveness of magnesium supplements on patients with heart disease and found that heart disease patients who took magnesium twice a day for 6 months had better physical stamina and healthier blood vessels. Digestive diseases like IBS, Celiac and Crohn’s disease can prevent you from absorbing a healthy amount of nutrients including magnesium. If you just can’t seem get some pep in your step magnesium deficiency may be your problem. Magnesium plays a major role in the way the body produces cellular energy. The most main source of energy in the body is ATP (adenosine tryphospate), which much be bound to a magnesium ion in order to be biologically. If the ATP in your body is finding it hard to partner with magnesium it may leave your tired and fatigued. Migraines can be debilitating. And if you do get them you may be low in magnesium. People who suffer from migraine headaches usually have lower levels of tissue and serum magnesium compared to those who do not. One study showed that supplement with 360 to 600 milligrams of magnesium daily reduced the frequency of migraine headaches by up to 42 percent. Research has shown that women with PMS (premenstrual syndrome) symptoms are lower in magnesium levels than those that without PMS. Magnesium deficiency has even been linked to a variety of other women’s health issues including hormone balance, bone disorders, cramping, low energy, migraines, and mood swings. 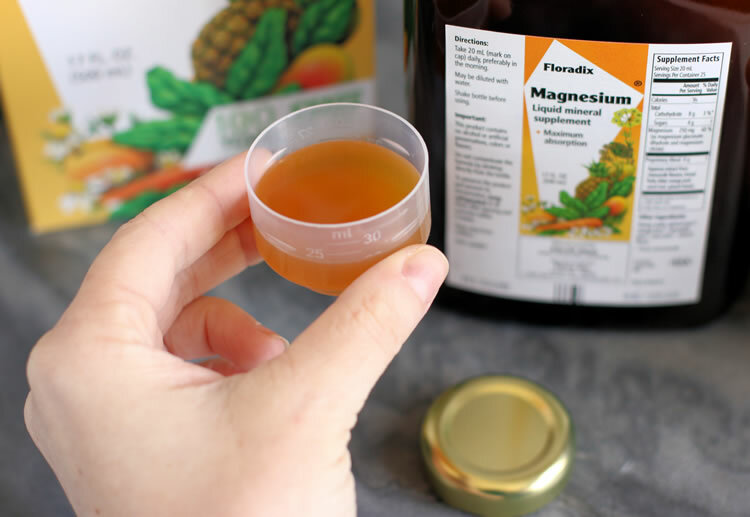 Certain drugs like diuretics, asthma medication, birth control pills, estrogen replacement therapy or heart pills can decrease the amount of magnesium in your body absorbs while increasing how much is flushed out by the body. If you regularly drink coffee, tea and soda regularly you have a higher risk for magnesium deficiency. Caffeine causes the kidneys to release extra magnesium even if you’re deficient. Besides caffeine dark colored sodas contain phosphates, chemicals that bind with magnesium rendering it unavailable for body to absorb. Magnesium plays an important role in the way your body metabolizes sugar. Magnesium aids in the activity and release of insulin and maintaining healthy blood glucose levels. And magnesium deficiency can be not only be a cause of type II diabetes, but also a symptom. Diets rich in magnesium have been shown to significantly lower the risk of type 2 diabetes. A recent study found that adding just 100 milligrams per day of magnesium lowered the risk of diabetes by 15 percent! The older we get the more at risk we are for magnesium deficiency. A study published in Biology Trace Element Research found that supplementing with magnesium slowed the onset of osteoporosis “significantly” after just 30 days. Combining magnesium with vitamins D3 and K2 is an effective way to naturally build bone density even if you may already have osteoporosis. But nutritional experts agree that it’s extremely difficult to obtain all the magnesium you need from diet alone. While most of us aren’t making the right food choices, modern food processing has left our food supply stripped of magnesium and other nutrients. Recent reports have stated that the magnesium content in our vegetables has declined anywhere from 25-80% in the last century. And even worse, grain processing methods used for making breads and pastas is even worse. It can remove 80-95% of total magnesium. The evidence is clear. Most of us just aren’t eating enough of the magnesium. So what do we do? Adult men should aim for approximately 400 milligrams per day while women should shoot for around 300 milligrams daily. 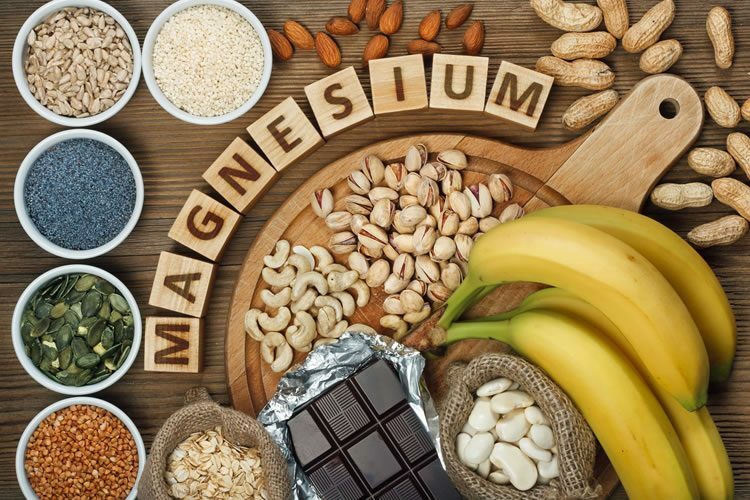 Poor food choices combined with a general food supply low in magnesium have health professionals recommending magnesium supplementation to make sure you meet your needs. If you’re looking for a boost of essential magnesium essential we highly recommend Floradix Magnesium Liquid. 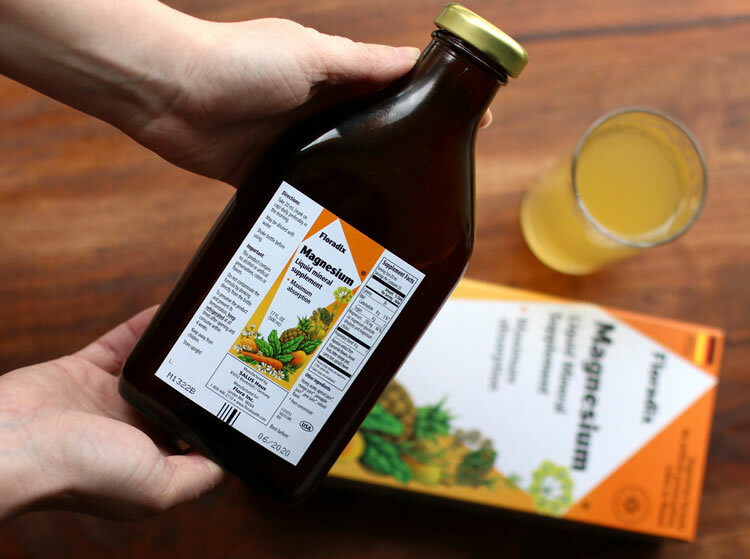 It’s an easy-to-digest liquid solution that’s actually quite tasty and will give you 250 mg of absorbable magnesium per daily dose. We also love is how tasty it is. 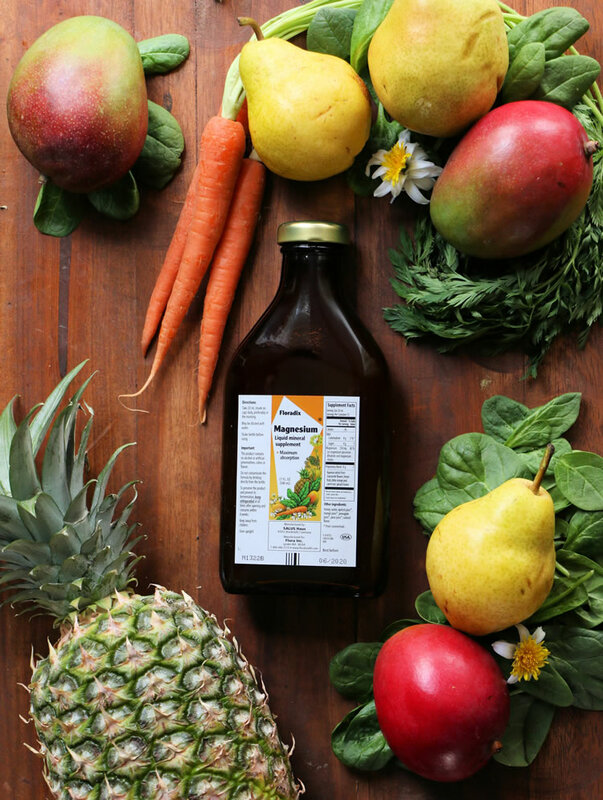 Floradix Magnesium Liquid is blended with pineapple, mango and apricot juice with extract of chamomile flowers, fennel seeds, bitter orange peel, carrot, spinach and honey. It even comes with a little measuring cup so you can decide if you would like to take more or less. Take it on it’s own or blend it with your morning juice or smoothie. Either way you’ll be feeling great. 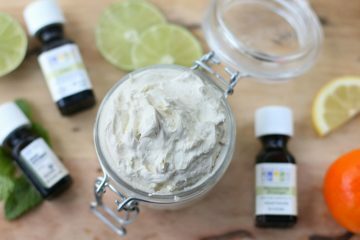 Want to boost your magnesium levels and see your health bloom? 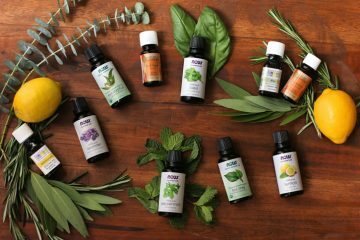 Please visit Florahealth.com for more information, recipes, health tips or to order your own Floradix Magnesium Liquid.